Shawn: Dr. Brown is real doctor. Dr. Craig Brown is a family practice physician who recognized the need for a fully-vented bottle. Together with Handi-Craft Company, he helped develop what is today the Dr. Brown’s Natural Flow® Baby Bottle. I guess I didn’t truly have a bet about who Dr. Brown is, but I think were all winners now that we know the inside scoop on Dr. Brown’s. Although I would recommend some more information on the Dr. Brown’s Web site on my guy Craig. But he may be a humble, behind-the-scenes guy not wanting attention. But that is silliness. Thanks Dr. Brown’s Facebook Wall Replier! LIAM AND HIS BEARS STREAK: Marathon Man brought this to my attention: Liam hasn’t felt the pain of a Bears loss during his lifetime. At 2-0 it’s been only wins for him. Can the streak stay alive against Green Bay? We’ll find out Monday. I like our chances. Will This Post Be Here Forever? 1) How long should I continue to blog regularly? 2) Will what I post be here forever and will Liam be embarrassed by it? 3) If we are lucky enough to have more children, will I continue this through them? I guess the easy answer to all three queries is, We’ll See. I think there’s a safety and privacy concern at some point especially when you speak of photography and video. And I need to have a motive for blogging. Mainly, I enjoy having an outlet to write. Secondly, it’s fun to chat about certain topics and share information and updates on our family giving family and friends a handy resource to keep updated. Future children can only be considered when they arrive. I guess at the end of the day, I’d like these writings to be around in some fashion forever. When I’m gone, I would think Liam and his future brothers/sisters would enjoy reflecting on these posts like I enjoyed looking through my Dad’s things connecting dots that I didn’t know existed. Although it’s a marathon of a read, this NY Times article looks into the idea of Web content and its longevity. It’s a solid read for anyone who has posted a photo to Facebook, created a Tweet or updated their LinkedIn profile. The moral of the story is take possession of your online belongings. GO SOX: I had a chance through NDDC to visit U.S. Cellular Field Thursday night to watch the first place Chicago White Sox. They did not disappoint. It will be Twins/Sox down the stretch. Thank God the Metrodome is gone. Speaking of the Sox, I watched the first episode of The Club–MLB Network’s reality show featuring the Sox. It was solid and recommended. Even for Cubs fans, it gives an insight to workings and philosophy of the south side ball club. Sox All-Star Matt Thornton warming in the pen. But Freddy Garcia got out of the jam and his services weren't needed. 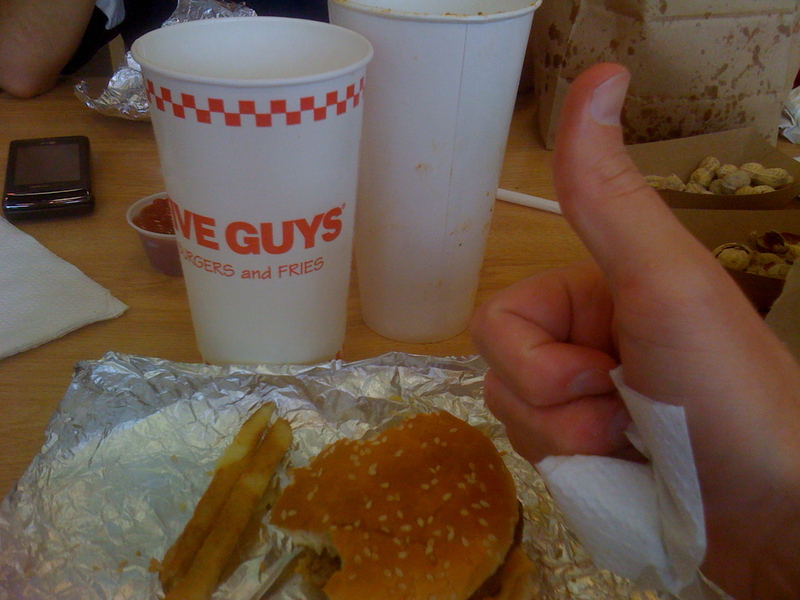 FIVE GUYS: What else is there to say? Simply, it’s worth a trip to 2140 N. Clybourn. I always wonder why I talk in a different voice to Liam than I do regularly. Apparently it’s natural to do so and actually helpful. I’ve heard that making faces and repeating noises from babies is positive to the baby, but WebMD confirms this notion. Alan also talks to babies in The Hangover. You’ll remember Carlos. Okay, this is simply an excuse to toss in a Hangover video portion to today’s post. This video isn’t appropriate, by the way. And you can like Carlos on Facebook, too! The video below also tests this theory. Liam is finding his voice, apparently. 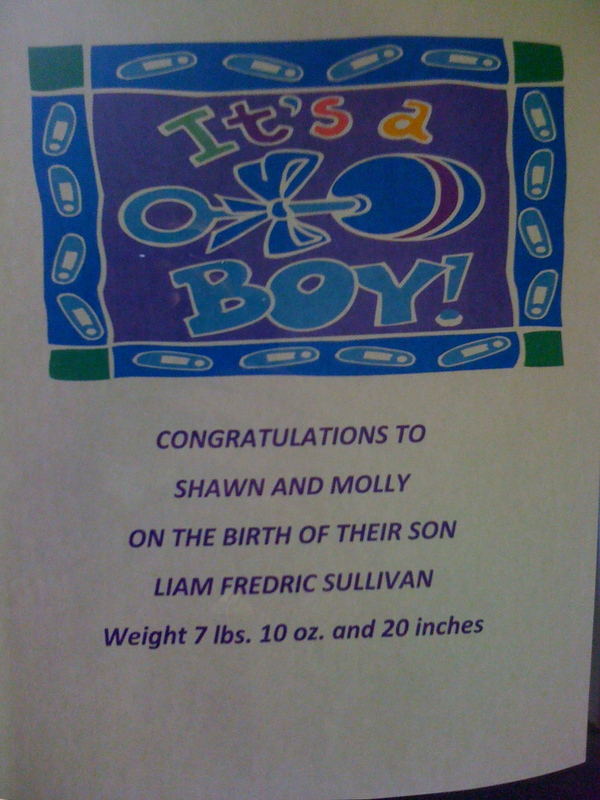 This document was posted at work last week when Liam arrived. Thanks Wanda! Today featured our inaugural visit to the pediatrician. It was a success. Liam is back to his birth weight, increased a half inch and remains ridiculously good looking. He was a champ last night–sleeping very well in his bouncy chair. One, uninterrupted four hour stretch and another three hour segment provided SulliParents a pretty good night. Thanks for all the suggestions via blog, Facebook and text! It looks like a swing could be in the works and Craigslist might be an outlet for purchase. And then, as great as he slept last night, he was just as sour earlier this evening. It seemed nothing we did could calm him. But after about 40 minutes or so of chapped tail, he simply belched up a little milk and then he was fine. I think what I’m learning is that there are going to be times when there are no answers, solutions or methods to fix things. We keep learning. It’s like an internship at the “How to take care of a human” school. It was Sullivan Family day in University Village. My sister, Kelly, and her guy Nick visited, bought lunch and brought more gifts. Then, this evening K3-SulliGrandma came up with my Uncle Dave and Aunt Sue and a quick cameo from Aunt Emily and Ted. Of course, more gifts arrived with their arrival. Tomorrow, the Stearns family returns and I can’t wait to see our niece, Tess, and see how she interacts with Liam. Tess is nearing 19 months old and will be arriving straight from Midway. Plus, it will be nice to learn a few tips from my sister-in-law and the mother of Tess, Sarah, who just went through this with her daughter and is expecting number two in August. Lastly, I think I have a good idea of what I want to get SulliMom for Mother’s Day, but I’d love to hear some ideas from mothers who have enjoyed this holiday in case I can use the idea during future Mother’s Day activity. Please e-mail your suggestions to sullidadchicago@gmail.com.